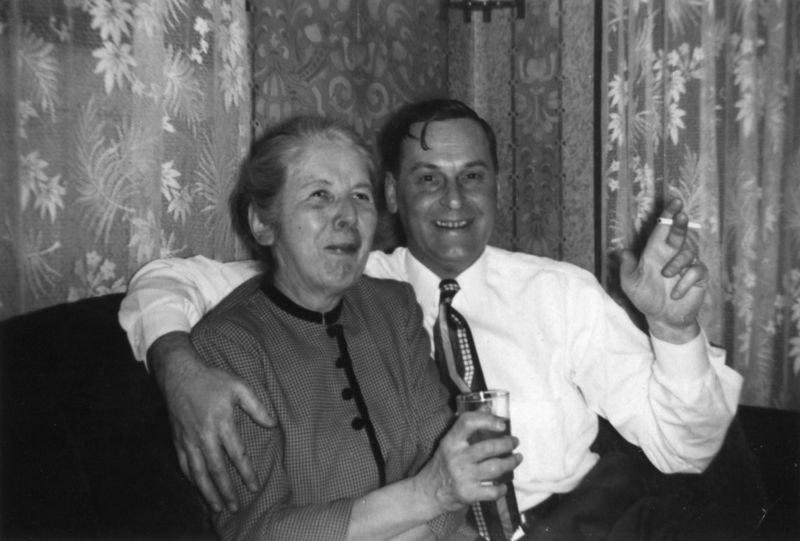 You may think Wednesday’s crack about Grandma getting tipsy off a couple ounces of Miller High-Life was a joke, the photo above shows that the Cool Kids drank High Life. This is clear proof is from the Pfister Hotel set, but the distinctive trapezoid label with an ‘X’ sticker right above it makes the bottle very recognizable even in small photos from other sources. Granted, these photos are from Wisconsin — Milwaukee is the home of Miller Brewing, and until the 70s there wasn’t as much national distribution as there is today. People tended to drink the beer that was brewed nearby, partly out of sentimental reasons, but also because you knew the beer was fresh. Your parents probably have stories about driving to another state to buy some good beer — driving from North Dakota to Colorado to buy up a pickup-truckload of Coors has been told to be by more than one person. One poster at Beer Advocate tells of driving to Wisconsin for some High Life…but more because of the lower drinking age of 18. As for the sentimental reasons, High Life had already been around for fifty years by the time this photo was taken — it was “the champagne of beers”, for crying out loud. Regardless if the stuff tasted like crap, you didn’t dare buy something else when company was coming over, and being caught at a swanky hotel lounge drinking anything else would be a travesty. Give Grandma a jelly-jar glass of Miller High-Life, and she might start to get a bit tipsy, don’t you know. Sometime in the 50s in Wisconsin, there was a party — I’ve got more pictures to upload — that prove there’s a big gap in what partying means today. In the 21st century, partying is what kids do. People get wasted on their 21st birthday, get their first job and drink every Friday and Saturday in bars with loud, untalented rock bands screaming into microphones, and sleep the bender off every Sunday. By the time they’re thirty, those childish ways are behind them and partying now means a $12 martini with a $20 steak and a jazz trio in the corner. The fifties were less age-centric in their parties: Kids did their partying when they had the money and time to do so, but grown-ups didn’t see getting plastered as a childish activity. If you’re in your thirties, ask your parents for stories about your grandparents: unless they were teetotalers, they probably had raucous parties…which, for the time period, meant listening to mildly naughty comedy records, playing cards, air so smoky it turned blue, drinking so much that someone had to be carried home, and driving all over town without fear of being stopped by the cops unless you actually hit something (then sitting bleary-eyed through church the next day). No wet t-shirt contests, no noise ordinance violations, no stepping over people sleeping on the floor at 11am who were too drunk to drive, no vomit on the front porch — fifty years makes all the difference. Especially the wallpaper and drapes. The modernism of the sixties and seventies have ruined our decor. In the fifties, you could install flocked wallpaper without any sort of irony. Today, we might think that they had to be drunk to buy that wallpaper back then…they probably were, but it had nothing to do with the decor. My first reaction was that this advertisement, published in a 1952 farming magazine, was steeped in anti-communist propaganda. After all, socialism and communism are terms arm-in-arm, almost interchangeable, depending on where they’re used. The Union of Soviet Socialist Republics was the enemy, we had just defeated Germany’s National Socialist party, so in 1952 socialism seemed to be America’s greatest enemy. The threat here turns out to be closer to home. Eisenhower, as I mentioned a couple days ago, was quite ‘left’ when it came to socialized and public works. Socialized power, or, rather, federally-funded power plants, was high on Eisenhower’s ‘to-do’ list. Eisenhower didn’t have some haughty Marxist ideals — he had been a leader during WWII, and saw first-hand how a country’s strong infrastructure kept it operating during adversity. Eisenhower’s highway system is still the road upon which American commerce and communication rolls, and he thought having federally-controlled electricity would allow the country to weather problems by controlling the source. Private electricity companies, as you might gather, felt quite threatened by the possibility of their racket being leaned on by government influences. “Won’t Someone Think of the Children?” the power companies cried, so soon forgetting how Roosevelt’s REA program brought hot water and radio to the children of the farmers that bought this magazine. At least with REA, private companies got the money for the work — turbines at Niagara was another thing altogether. You probably don’t know about this aircraft, because its origins and operations are so secret even the US Government doesn’t know about it. The F-19A SPECTRE is one of the US’ many Stealth fighter aircraft developed in the 1980s. The thing is, these imaginative stealth planes weren’t developed by anybody in the aerospace industry. The aircraft design above used for the Monogram’s Stealth F-19A Reconnaissance Fighter 1/72 scale model. Whoever designed it was nice enough to include, in various places, diagrams comparable to the usual aircraft graphics seen in Jane’s guides, as seen here. 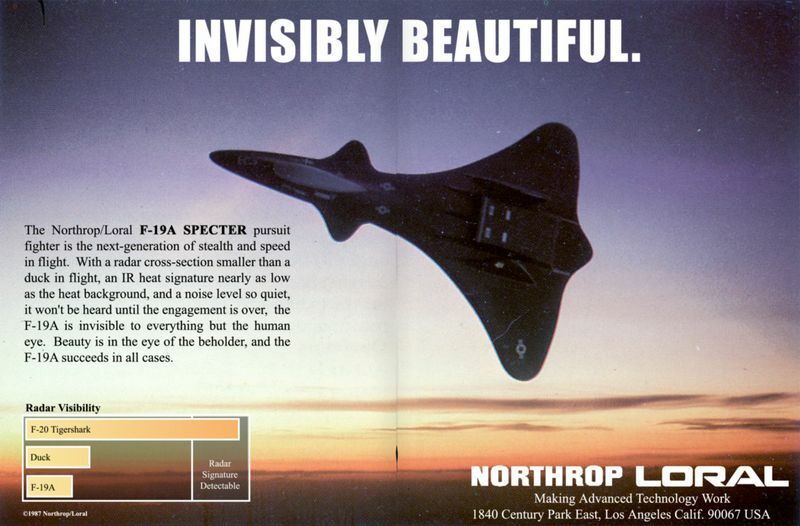 This version of the Stealth is my favorite, based on a concept by Loral Aeroelectronics that appeared many places, like the airplane book I scanned the poster’s background from, seen above. Testor’s version was first on the market and got the most publicity — including being shown to Congress with the politicians demanding why, if the program was so secret, would a model company be releasing designs to the public? Little did they know, the stealth aircraft in Skunkworks hangers looked nothing like any of the theoretical toy designs. Harriman was a serious contender; he had been holding offices of one sort or another (the Governor of New York at the time), and a few short weeks after the political cartoon above Harriman appeared on the cover of Time magazine. Harriman was a New Dealer during Roosevelt’s days, but his rich family gave him appeal to businesses and the Wall Street crowd. Eisenhower had continued many New Deal programs on his own, so why the comic? Let’s take it apart: Harriman, a New Deal proponent, was a early Democrat contender. However, he’s got the money and big business interests in his pockets. Eisenhower, too, kept up with the New Deal and worked towards balancing the budget, while working on military strength. 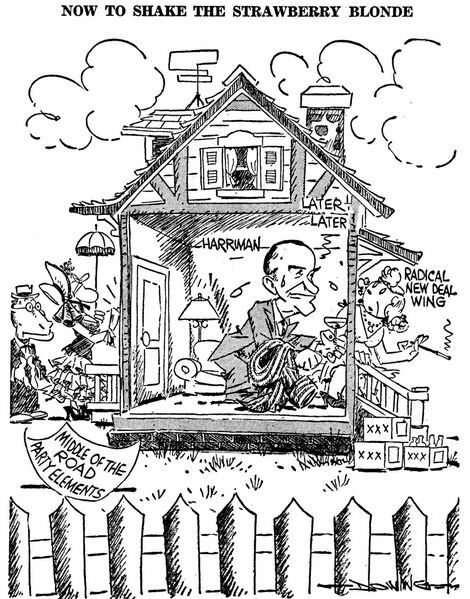 Harriman, it seems, was more like the Republican incumbent than the Democrats wanted — the comic implies that the Democrats were looking for a more centrist candidate. Harriman was ’sleeping’ with the leftism of the New Deal, hiding his vices out the back door — but Harriman was about to greet the centrist Democrats with open arms while his vices patiently waited out back. Public opinion must have agreed — the more centrist Adlai Stevenson was brought back to run against Eisenhower for a second time, after losing in ‘52. Harriman, despite his early lead, apparently couldn’t shake the strawberry blonde on the back step. We’ve seen the North Dakota scenery from West Fargo in the 1930s, which is a little unfair to the area. 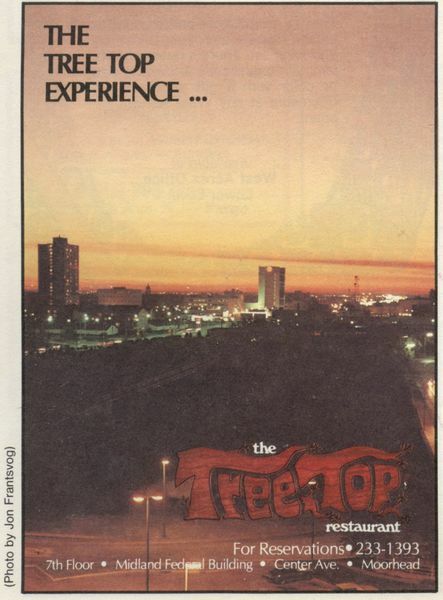 In 1983, the Tree Top restaurant — once at the top of the tallest building in Moorhead — put this photo in their advertisement. At the far left is the low-income highrise, thanks to Urban Renewal; a little to the right of it is the Professional Building, where my childhood doctor worked; a little right of center is now the Bank Of The West building (formerly a half dozen other bank names), and to the right of that is the microwave tower on top of the Burlington Northern offices. We’re looking straight west from the MF Building — but that’s not really downtown out that way. Downtown Fargo is off to the right of this photo, and would have been dominated by the Fargo Forum’s neon sign, the Black Building, and the First National Bank building. It could be partly that this was the best angle, with the setting sun; it could also be that those were the tallest, most-modern buildings in Fargo at the time, while the next-tallest buildings are examples of Art Deco and Federalist styles of the early 20th century, and who wants to see that? But if they were looking for tall buildings — why not take a picture of the Radisson? Sorry, that was still two years away. I’ve started scanning a new family photo album — another one from Wisconsin, and this one had all the ‘good’ photos removed, leaving the ones I’m scanning behind. Why were they rejected? I can’t tell. 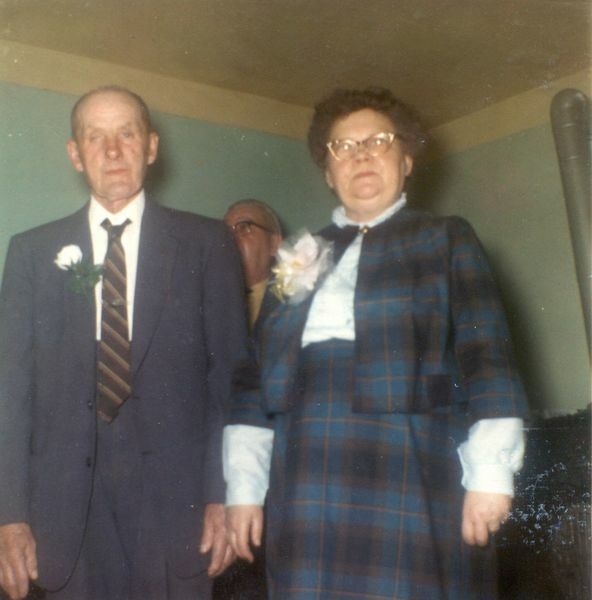 Most of these photos are also unmarked — but the one to the right was important enough to be captioned: “Bertha and Husband.” I wonder which one’s Bertha? Howard Binford was a journalism icon in the Fargo-Moorhead area during the 60s and 70s, training the media personalities of the future and publishing his own magazine. 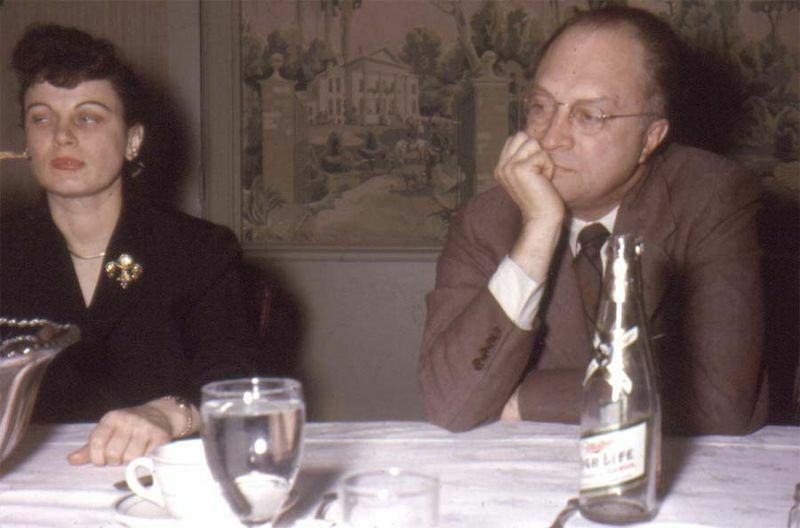 Late in life, Binford starting publishing his Howard Binford’s Guide in 1968, interviewing a series of locals who were quite obviously Binford’s friends, church acquaintances, advertisers, and co-chairs on local boards. Still, he was a bright and entertaining editorialist, and the magazine was actually useful to non-locals on holiday and residents alike. Looking forward, Binford began to pass control to his assistants in 1984, sold the magazine to a local publisher in 1986, but his health got the better of him at the end of 1988 and he passed away. 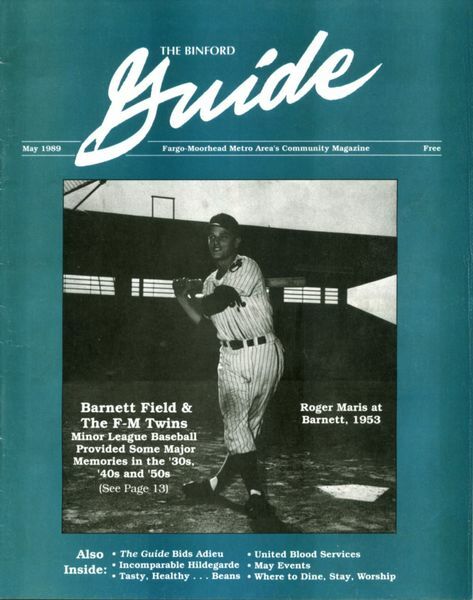 Without Binford, the Guide ended publication with the May 1989 issue. The Guide was clearly valuable to the community: most of the magazines I’ve collected were aquired in large lots — people saved years and years of the guide in their basement. I’ve got almost the entire 1980s uploaded, a good part of the 70s, but those 1/8th-size pre-1975 Guides are tough to find. In July 1953, Margaret flew across the Atlantic ocean, from Paris to New York. 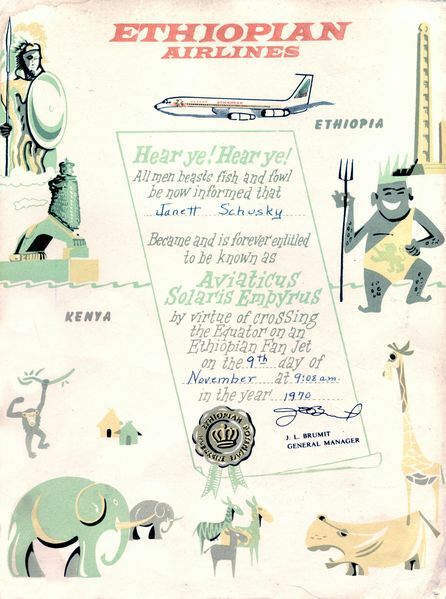 This was during some of TWAs heydays — Hughes was in control and hadn’t gone completely nuts yet, of travelling abroad was still a luxury but was beginning to reach the common people during the postwar boom, and the process was more comfortable and safer than ever before. 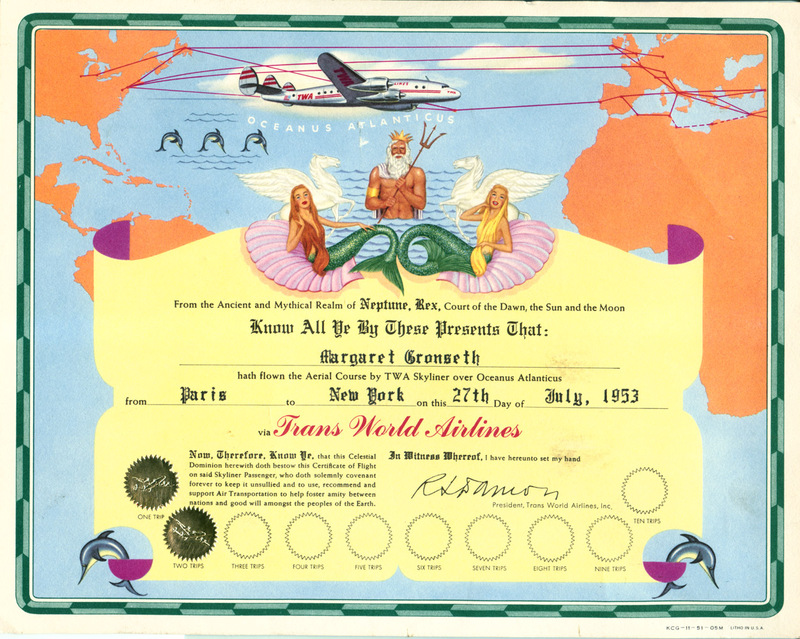 The bottom text is the most important to note, though: by being awarded this certificate, the bearer was bound to recognize that they were to promote air travel, and recognize its value to international relations. In the fifties, air travel wasn’t just bus service between big cities — it was diplomacy serviced by stewardesses. You are currently browsing the The Infomercantile blog archives for February, 2008.